The J3 was developed in 1954 as an airhorn for Canadian snowplows. The horn blew the same, government-mandated D# minor chord as the M3H, but the design was lower-maintenance and non-tunable. The J3 narrowly preceeded the introduction of the popular K-series, and the bells resemble K-bells externally. Internally there are several differences, including the use of one-piece diaphragms instead of the K-horns' two diaphragms separated by a rubber gasket. The manifold, which placed the bells in a triangular arrangement, was also used on early K3's. 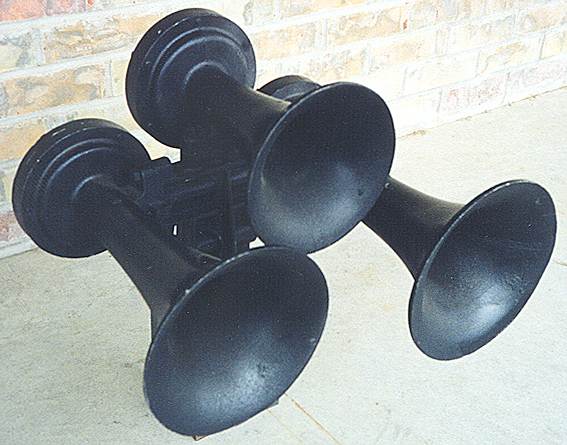 The J3 horn pictured was cast by Holden Ltd. of Canada, an AirChime licensee.